Michael Varner’s publication at IEEE SPAWC 2018 is now available for download in IEEExplore. 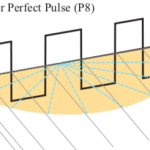 Entitled “Reflection of Modulated Radio (ReMoRa): Link Analysis of Ambient Scatter Radio Using Perfect Pulses“, the work explores the spectral properties for perfect pulse modulation of ambient backscatter. The impact on this modulation scheme and the link budget is explored. The ideas in this paper will allow long-range communications by embedding information on existing RF sources and reflecting them to collection nodes. There are numerous applications in machine-to-machine, internet-of-things, and sensor networks.